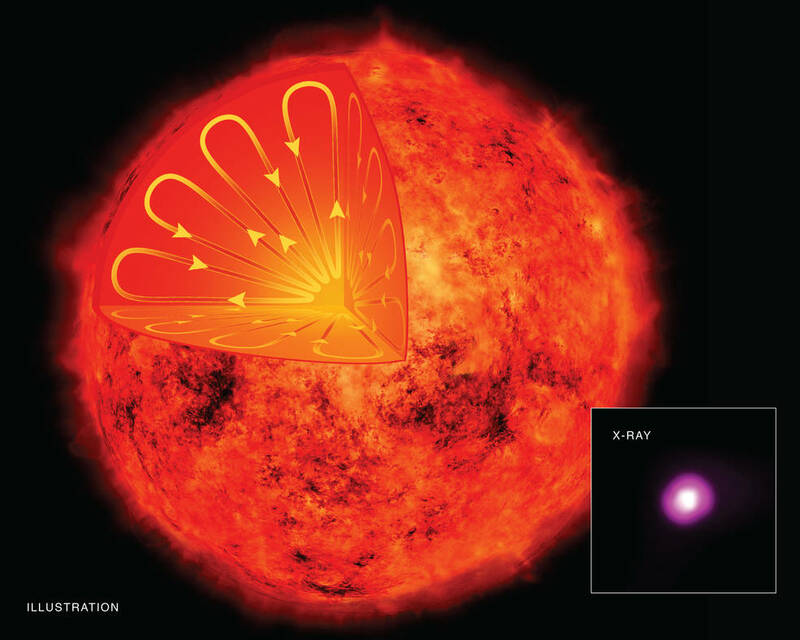 An artist’s illustration depicts the interior of a low-mass star, such as GJ 3253, a low-mass red dwarf star about 31 light years away from Earth, seen in an X-ray image from Chandra in the inset. A new study of four low-mass stars may have important implications for understanding the magnetic field of the Sun. Magnetic fields are responsible for solar storms that can generate auroras, knock out satellites, and affect astronauts in space. X-ray emission is an excellent indicator of a star’s magnetic field strength. Two low-mass stars observed with Chandra and two by ROSAT showed their X-ray emission was similar to that of stars like the Sun. The Sun and other stars are giant spheres of superheated gas. The Sun’s magnetic field is responsible for producing sunspots, its 11-year cycle, and powerful eruptions of particles from the solar surface. These solar storms can produce spectacular auroras on Earth, damage electrical power systems, knock out communications satellites, and affect astronauts in space. Read More from NASA’s Chandra X-ray Observatory.